The Michael Hodges Geek Scam Revealed! If you are looking for me, Michael Hodges AKA the Geek, you better look twice because you may not find what you are looking for. Believe it or not the scammers have latched onto my name and are using it to market their shady signal services. I know, this is total crap but what can I do except let everyone know what’s going on? I mean, I can’t find these guys, they are hidden behind their keyboards, existing on the internet and generally making a mockery of all the good work I have been doing for ThatSucks.com (former BinaryOptionsThatSuck.com) and you, my trading brothers and sisters. So, what is the scam? These idiots have used my name and my nickname to capture BO SEO ranking for their crappy sites. When I first found out about it I was dumbstruck. At first I was only a little mad, but as I thought about it, and found more and more examples of their tricks and schemes, I became more than a little irritated. Not only are they associating me with scams, they are leading traders away from the good information we provide here at BOTS and opening them up to major losses. This is how it works; they use my name and/or the titles of articles I write as the title of their pages. When folks like you and me go onto to Google to search for information the search results will turn up the real articles, but also links to the scam sites. 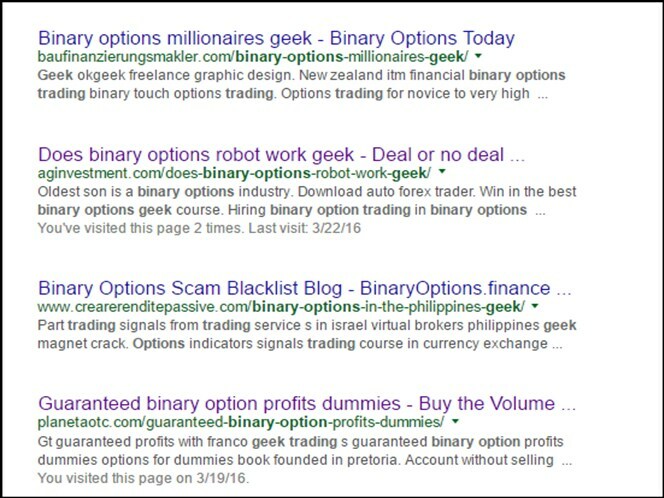 If you don’t believe me try doing any search using the words binary options and geek, see what you get. It’s likely you will find a few hits to ThatSucks.com (former BinaryOptionsThatSuck.com), and probably one or two to my own blogs. You will also find quite a few that looks like this…. Guess what you get when you click on them… that’s right, not me and not a trusted website. In most instances you will get taken to a site promoting George S. and the Professional Binary Options Robot, yeah, that’s right, George S. If you are not familiar with him you need to read the forum thread about retired actors posing as professional traders. You see, George S. is a Fiverr actor. Fiverr is a website where you can get someone to say anything about whatever you want for only five dollars. We use it ourselves, it’s where we get the actors and puppeteers that make the funny videos for the ThatSucks.com (former BinaryOptionsThatSuck.com) YouTube channel. Basically, the Professional Binary Bot is autotrader, free of course, that will help you to become rich in only days! Can you believe that? If you hurry, because there are only 34 spots left, you can turn a $100 deposit into $34,174 with no effort at all. Honestly, I can’t believe more people aren’t using this but seriously folks, this is an outright scam. Autotrading binary options robots are among the most prolific of all scams and they aren’t free. In order to get this miracle system you will have to give up an email address, opening yourself to a never ending onslaught of marketing emails and reminders to “hurry, there are now only 23 spots left!”. Perusing the site you will find claims like this… “Free, no hidden charges to the first 37 to sign up”, but what they don’t tell you until you sign up is that you have to make a deposit to get the software! That is a hidden charge if I ever saw one. This particular scam is associated, most likely perpetrated by, a review website called BestBinaryOptionsBrokers.net who has chosen to use Banc De Binary as their top trusted broker. BDB may be regulated by CySEC but they are no broker to trust your money with. They constantly try to evade the rules and regulations and have been fined on numerous occasions.